Some people prefer having reptiles as pets rather than the more conventional dogs or cats. If you’re someone who loves having exotic animals, such as reptiles, for your pets, choosing the right cage for them is a priority. Even more so if you expect the reptile to grow to a certain size. Reptiles such as lizards, snakes, and alligators need to be placed in large reptile cages for a proper and safe enclosure. If you must keep reptiles as your pets at home, proper knowledge of their needs is highly important. Reptiles feed differently than most domesticated animals such as dogs, cats, or rodents. Also, reptiles need to have the right cages to keep them at a certain distance. Not everyone is thrilled about the idea of associating with a reptile, so to be safe, you need to keep them in sturdy cages. The size of the cage matters a lot, especially if you expect your reptile to grow even bigger in the months or years to come. Certain types of snakes can grow anywhere from 5 feet to 7 feet long, and even longer. Young iguanas typically start small, but once they grow to a bigger size you might want to consider getting a bigger pen for them. Typically, a selection of reptile cages is found in pet stores, so choosing the ones you need don’t have to be difficult. The sizes may vary as well so you need to make sure that the cage you are buying is big enough or deep enough for your pet. You would not want your reptile pet to live in a constricted space or in a cage that feels threatening or uncomfortable. Some pet owners have difficulty in finding the right cages due to size problems or issues on quality. Fortunately, you can find a range of cage making plans online, wherein you will only need to follow the right instructions and procure the right materials for your cage. This means that you can build your cage using the right materials, and you can monitor on its quality and durability as well. If you are not handy with tools or if you are still a novice in handling reptile pets, you might want to think twice about assembling cages on your own. Also, you can seek advice from professional cage makers or get some helpful tips from pet store owners. Buying cage accessories is also important, such as carpets or substrates. As reptiles are cold-blooded animals, they need sufficient heating as well. Thus, heating lamps in cages are also indispensable. 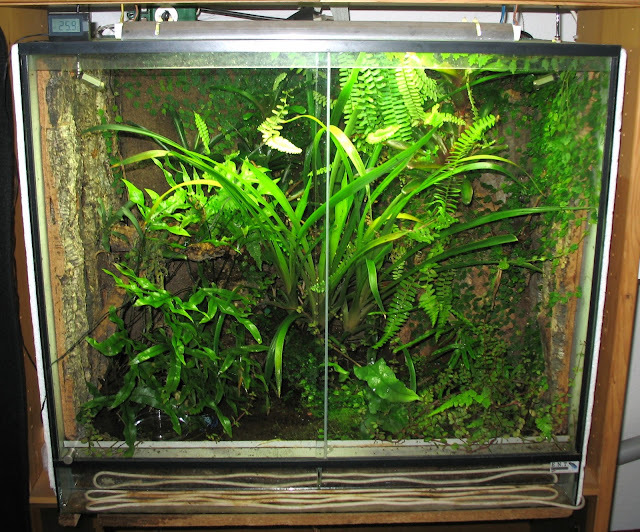 Since most reptiles can easily grow to bigger sizes, large reptile cages can easily accommodate them. Going for bigger cages can prove to be a better investment in the long term especially if you are a reptile pet owner. Our author likes exotic animals and pets. He owns some reptiles which he keeps in reptile cages in his home. He uses special reptile lighting to keep his snakes nice and warm. To find out more about reptile pet products, please go to petstore.com. People have all kinds of different pets. Some people only feel safe with what is considered "normal" pets. This usually consists of cats, dogs, hamsters, or birds. Country folks may have farmyard animals for pets. Horses, cows, goats, bunnies, and so on are typical. Then you have the people who pride themselves on being "outside the norm". These people may be the sort who likes to consider themselves and their pets unique. Or maybe they just love animals of all kinds and welcome any and all types of pets. Reptiles have been kept as pets for many years, but as the number of pet stores has grown so has the number of reptiles kept as pets. Sometimes this is bad news for the reptiles. If a dangerous reptile is chosen, it could be bad news for the owner as well. Sometimes the type of pet a person has depends on the area in which they live. Availability may make the choice for them. The environment is also a consideration. In south Louisiana, a child may be raised thinking an alligator is normal to keep for a pet! It would be impractical for a child who lives in the midst of the city to own a pet cow. What types of reptiles are popular as exotic pets? Snakes, lizards, and turtles make the choices wide. There are some, however, of each type that makes some better choices than others. Unfortunately, these types of pets are also the most often abused and neglected simply because of failure to learn about their proper needs prior to ownership. Once the new wears off, they become forgotten. Because reptiles are often quiet and contained, it is easy to forget they are around. Corn snakes are often chosen because they are known to be easier to care for. They are excellent escape artists, though, so great care must be taken to keep the latches tightly closed on their enclosures. It may seem funny in the movies to see a snake escape and scare the family or guests, but it can cause great harm to your pet in reality. Boas are a well-known reptile pet, but people often underestimate their lifespan and their great size when grown. A snake kept in an area it has outgrown will not be a happy, well-adjusted pet. It may cause the snake harm and you as well, should he choose to fight back because of his discomfort. Those cute little reptiles grow up and will need different requirements for food and housing as they grow. A responsible pet owner will be prepared for the changes and willing to accommodate. Can you recreate the natural environment and maintain it? Think of it as being a person from the country who moves to the city, unwillingly, and never learns to adjust because they just don't seem to fit into the new surroundings. Except this person has the ability to move back to the country, while the snake is unable to make this choice on his own. The right housing makes a happier pet.